Barack and Raul is the new dance beat in Cuba, but will it catch fire for Congress to end the blockade? Even as an American Filipino, an Asian American, it’s hard not to be engaged by the historical news happening in Cuba. People are getting choked up over seeing the first American president in Cuba since Calvin Coolidge in 1928. True, we are watching history–evolve. If we look at U.S.-Cuban history, it has always started from a very bad place, marred by a sense of arrogance and paternalism, even before the Spanish American War. You’ll recall as a result of the U.S. victory in that war, the Treaty of Paris forced Spain to give up Cuba, Puerto Rico, and Guam to the U.S. in 1898. To sweeten the deal, the U.S. got the Philippines, too. But it cost our country an additional $20 million. It’s a little more than the $24 the Dutch paid for Manhattan. But the Philippines is a 7,200 island archipelago, after all. For that price, the U.S. got my father too. Filipinos in the Philippines weren’t “Americans.” Nor were they citizens. And when Coolidge was heading to Cuba in 1928, that very year, my dad was coming in by boat from Manila to San Francisco for the first time. My father was on the Dollar Steamship Company’s President Pierce, named for the 14th president of the United States—and perhaps the worst president who ever lived. Pierce was a Democrat from New Hampshire, but he also was a moral compromiser. He was a pro-slavery, anti-abolitionist friend to the South. Pierce would hardly be considered a “good” Democrat today. An expansionist who believed in manifest destiny, he cut his teeth fighting the Mexicans in the Mexican-American War. So let’s see, he was worse than Trump and his wall. Pierce fought and killed Mexicans, and he was pro-slavery. That made his road to the presidency similar to Trump’s as well. Pierce faced a brokered convention in 1852, when after 48 ballots—that’s right, 48—he finally secured the nomination with a boost from Southerners. But what makes Pierce relevant this week is his foreign policy stand. His best “less than shining moment” was the Ostend Manifesto, Pierce’s attempt to buy Cuba from Spain, with the intent of annexing it into a slave state. The South needed a place to expand slavery, right? And why not Cuba? For you NCAA fans, Cuba could’ve been another member of the SEC! As you can see, before Fidel Castro, even before Calvin Coolidge, if we want to figure out the place where our attitudes toward Cuba developed, we must not forget the deeds of our 14th President Franklin Pierce, 162 years ago. That’s what they really mean when they say there’s lots of history to overcome. It goes further back than you think. 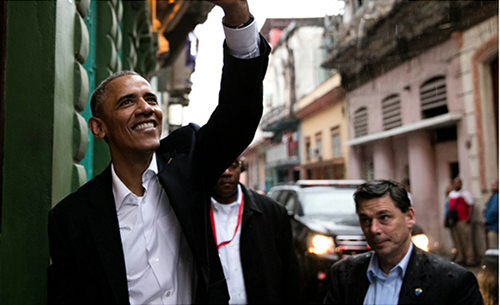 Given all that, I thought it was amazing to see the two presidents Obama and Castro engage in their news conference Monday, in what I call their “Barack and Raul show,” a formal and yet informal pas de deux. Pointed at the front end, but slightly more playful toward the Q&A. But due to all the history, it’s still a careful dance. In his opening remarks, Castro had his moments. He was referring to the land currently occupied by Guantanamo Naval base, saying it would be “necessary to return” that territory to Cuba. The question of human rights is the other huge issue that stands between the U.S. and Cuba. Again, Castro did not back down. “There are profound differences between our country that will not go away,” Castro said, who outlined them as the political systems, democracy, the exercise of human rights, social justice, international relations, world peace, and stability. When it was time for Obama to speak, he was gracious, and acknowledged “We have a half-century of work to catch up on,” and how the relationship “will not be transformed overnight. That’s for sure, but knowing the history goes back more than 160 years, this will be a much slower dance in Cuba than anyone thought. More fireworks came in the Q&A, when CNN reporter Jim Acosta asked a general question about the release of Cuban political prisoners. President Obama brought the conversation back to what opening relations with Cuba is all about: commerce. He said opening up dialogue to build new Cuban-U.S. constituencies could push Congress to end the embargo. He mentioned the opening up of joint entrepreneurial ventures on the internet, or in agriculture. But it always comes down to human rights. Of course, this hasn’t stopped imports from big human rights violators in Asia–namely, China. China, the big communist/capitalist contradiction, part-friend, part-owner of U.S paper, part enemy, was the elephant not in the room. And then Obama mentioned it. “Keep in mind, I’ve got fierce disagreements about the Chinese on human rights,” Obama said. Oh, but so di others back to Bush One. Remember the phrase, “Butchers of Beijing”? Again, history. “I’ll be going to Vietnam later this year,” Obama continued. “I have deep disagreements with them as well. When we first visited Burma, people questioned if we should be t raveling there because of longstanding human rights violations in our view. The approach that I have taken has been if I engage frankly, clearly, stating what our beliefs are, but also being clear we can’t force change on any particular country, ultimately, it has to come from within. That is going to be a more useful strategy than the same kind of rigid disengagement that for fifty years did nothing. It may not happen during his tenure as our 44th president. But it’s a far cry from the sentiments of our 14th, Franklin Pierce, who just wanted to buy Cuba outright. That was wrong. And this is now.